The bishops, who visited Israel, the West Bank and Gaza Jan. 11-15, said in a final statement that putting a human face on the events and suffering was the key to achieving peace. “We must humanize the conflict by fostering more interaction between Israelis and Palestinians. Peace will only come when all parties respect the fact that the Holy Land is sacred to three faiths and home to two peoples,” said the Jan. 15 statement. “We witnessed the tragic consequences of the failure of both local and international politicians to advance peace. Human dignity is given by God and is absolute. The ongoing conflict assaults the dignity of both Palestinians and Israelis,” the 16 bishops said. “Political leaders must defend the human dignity of the people in Gaza. … People of goodwill on both sides of the conflict want the same thing, a dignified life worthy of the human person,” they said. 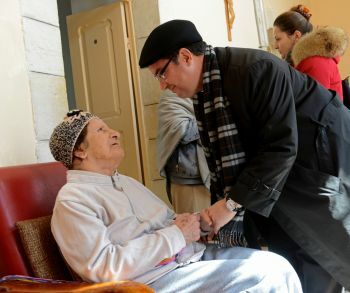 They noted the importance of their presence for the small Christian community in the Gaza Strip, reminding the community that they are not alone. In addition they noted the harsh living conditions — in the latest freezing weather, at least two infants died of exposure — and criticized the continuing blockade that impedes the much-needed rebuilding of homes. More than 100,000 people in Gaza remain homeless after last summer’s war between Israel and Hamas. 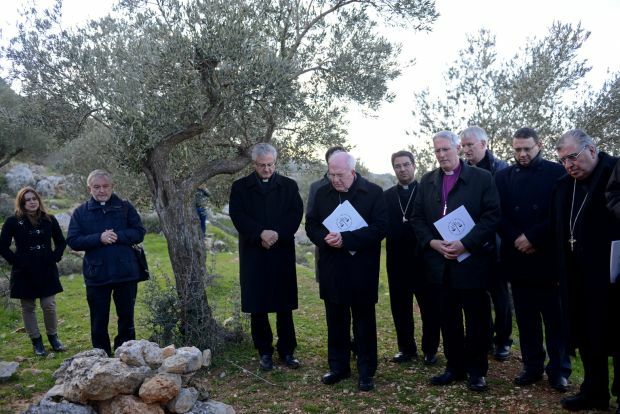 The bishops said they would continue to oppose the building of the proposed Israeli separation barrier in the Cremisan Valley, which would result in the loss of land and livelihoods of many Christian families. They urged all Christians to pray for Jews, Muslims and Christians of the Holy Land, saying: “The path to peace demands respect for the human rights of both Israelis and Palestinians. Our prayer nurtures the hope that makes peace possible,” they said. Since 1998, the Coordination of Episcopal Conferences in Support of the Church of the Holy Land has met at the invitation of the Assembly of Catholic Ordinaries of the Holy Land. Expressly mandated by the Holy See, the Holy Land Coordination meets every January, focusing on prayer, pilgrimage and persuasion with the aim of acting in solidarity with the Christian community as it experiences intense political and social-economic pressure.